Eggs Benedict and a NEW Gooseberry Patch Cookbook Giveaway! That’s right! A new Gooseberry Patch cookbook giveaway! 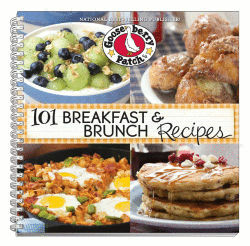 101 Breakfast and Brunch Recipes by Gooseberry Patch is an AWESOME cookbook ~ especially if you are a breakfast food lover like me. This series of cookbooks are my favorites because I LOVE cookbooks with photos and the photos in this book are great ~ they make me hungry which is always a good sign for a cookbook. More about the giveaway below! Eggs Benedict is my all-time favorite breakfast meal and it’s what I order if I am having breakfast in a restaurant and I see it on the menu. It’s not something I make for myself because it takes time and some attention when poaching eggs ~ which I am not great at. I also make Hollandaise from a package (Knorr’s) because I just don’t want to be bothered. This recipe is traditional and not hard to make ~ just take your time. The results are worth it! Brown the bacon in a skillet over medium heat. Meanwhile, fill a large saucepan with 2 inches of water and lemon juice or vinegar; bring to a simmer. Crack each egg in a shallow bowl, one at a time and slip carefully in the simmering water. Poach for about 3 minutes, until whites are set and yolks are soft. Remove eggs with a slotted spoon and let drain for a minute on paper towels. Top each muffin half with one tsp butter, a piece of bacon, one egg, and a spoonful or two of Hollandaise. Sprinkle with chopped chives and serve at once. THE GIVEAWAY HAS ENDED!!!! Now for the giveaway! All you have to do is leave a comment ON THIS POST telling me your favorite breakfast food. Very, very easy! The giveaway will be held from today ~ July 29~through midnight on August 11. I will pick a winner (using random.org) on August 12 and mail out the cookbook sometime within the next week. If you have any questions, shoot me an email. Also ~ PLEASE do not click the box that says something like click for replies to this post because you will get bunches and I can’t turn them off for you! At the present time, I am not adding anything to the A Recipe A Day facebook page since some people were having trouble with it. I don’t think it’s a problem on my end but I’m not going to add to it for the time being. I’ll be back there at the end of the summer. I like making omelettes, I chop up a lot of health veggies and some ham or bacon, add some cheese. english muffins w/ jam round it out. Make sure I have a big pot of fresh brewed coffee. now we’re talking!! I love scrambled eggs with ham, onions, and peppers. Never had eggs bendict but may try it some time it looks flood. Buttermilk pecan pancakes, scrambled eggs, turkey sausage, tomato juice and black coffee!!!!!!! Eggs Benedict made with smoked salmon is my all-time favorite. My husband and I would rather go out for breakfast than at any other time of day. Any type of donuts, oh heck……I just love any & all breakfasts! Even for dinner! Favorite breakfast is toast with peanut butter and banana and large glass cold milk. I love quiches made with almost everything. And of course, muffins!!! I love breakfast any meal of the day. I love French Toast & Belgin Waffles with Blueberry Syrup, that is my favorite breakfast when we eat out!! Eggs Benedict is my favorite. My husband makes them for me. Usually gets my egg right too! I just LOVE eggs benedict!!! Almost as much as I love Gooseberry!!! Bacon and potatoes with green peppers and onions then scramble eggs in a bowl to add with. This is my favorite meal! Love the recipe! I can only imagine what else is in this delightful mix of yummy recipes!! Thanks!! My favs are blueberry and banana oatmeal, and bacon, egg, and cheese on an everything bagel. But I could always use a new fav. I would say omelets loaded with peppers, onions, mushrooms, ham, and cheese is my favorite breakfast! It’s gotta be french toast! For me it’s also Eggs Benedict. And I too love to use the Knorrs packaged sauce. Now I’m hungy for some Eggs Benedict! Thanks! Love French toast especially with fruit topping. All of these recipes look delicious. Look forward to all these recipes in my new book! Gotta say that Eggs Benedict pretty much tops my list of my favourite breakfast food! Although I can eat it for any meal! LOL! I make mine just like you do – Knorr mix but I have an egg poacher so the eggs are super easy to do. Love having them with homemade hash browns – chucks of potatoe fried in butter with some added onions, mmmmmm. Also some fresh fruit and to wash it all down some good hot coffee. On special occassions – birthdays, anniversaries, etc. we also have mimosas – orange juice and champagne. This is our special meal for special occassions! 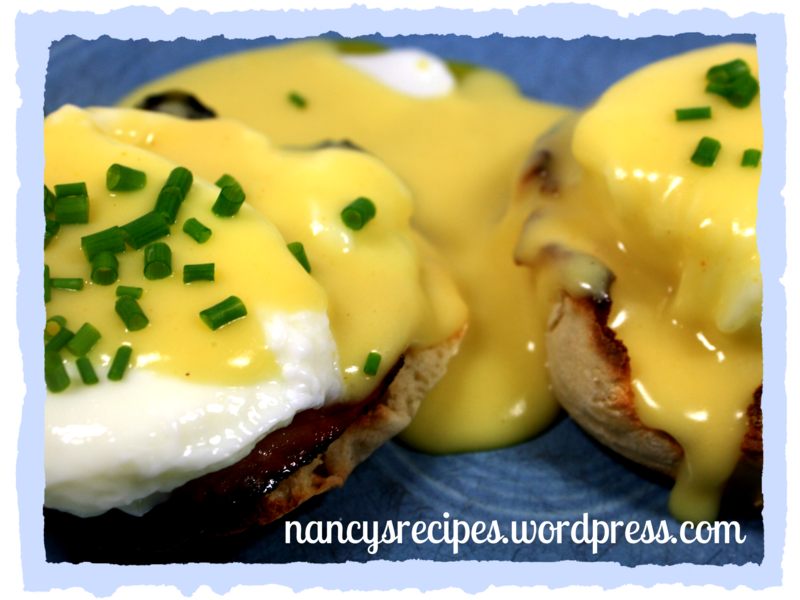 We actually call it Holly Days Eggs (Hollandaise) – I know it’s corny but it’s fun! I could eat homemade cinnamon rolls and waffles everyday. Thanks for the giveaway! I’m not a good breakfast eater so I need a good cookbook with pictures to inspire me! I do love oatmeal cereal with brown sugar because that’s what my mother used to make for me – it’s a memory thing. I think my favorite breakfast food is oatmeal, because there are so many ways to eat it! Put in different kinds of fruit or nuts or whatever, and you have a different breakfast every day! Eggs made different ways are my favorite. Eggs overeasy Homefries, Ham, and sour dough toast. My husband and my favorite breakfast. Thank you, this Cookbook is wonderful! My favorite breakfast foods are sausage and grits. I love corned beef hash with eggs with a side of fluffy pancakes! Yumminess!! My husband would say, Steak and Eggs. I like Ham and Cheese Omelet. And thank you in advance for the give-a-way and the recipe!! I am looking forward to trying it! Biscuits and gravy. I make mine a bit different than most but I have seen people literally lick the plate after eating them! I love biscuits with white karo syrup & butter. Thsnks for entering me in the gooseberry cook book give away! My very favorite breakfast is fruit stuffed french toast with bacon on the side. And of course, fresh squeezed orange juice! My favorite breakfast food is waffles with butter and warm maple syrup!! My very favorite breakfast has always been just plain bacon and eggs….I love the bacon crispy and my fried egg (fried in bacon grease)..I want to have that brown edge around the white and the yolk medium….a well done English muffin and I am a happy camper….I would love to have this book ..I entertain alot…….even after church we do brunch as we get tired of going to restaurants and this a lovely way to share and talk…thanks for listening or should I say reading…. I am a seasonal breakfast eater; in the summer I love Great Grains cereal with pecans and in the winter I fix hot oatmeal with brown sugar and pecans. And always a cup of coffee! My favorite breakfast food is hash brown omlette with bacon-lot of bacon!! Biscuits and “sawmill” gravy!! Side of honey glazed ham and cheesy hashbrowns….YUM, YUM!!! I enjoy a ham and egg braid. It is an egg mixture that includes onions, ham, green pepper and cheese wrapped in a crescent roll and baked. I Love French Toast, Extra Crispy Bacon and Mexican Hot Chocolate! Our favorite breakfast is mini cinnamon rolls made from crescent rolls. So easy but so yummy! I love french toast. But I also love eggs and sausage on an English muffin. Always looking for something yummy and easy for breakfast! My favorite breakfast/brunch food is a breakfast burrito! it has everything I love to eat in the morning~eggs, cheese, hash browns and bacon all wrapped up together in a warm tortilla! My favorite breakfast is biscuits and gravy! I love French Toast … yummy! : p Just had some made by my dear husband!!!! Warm peaches picked fresh from my backyard tree topped with Greek yogurt, slivered almondss, and honey . Mimosa to wash it down and read the paper with! Omelettes, quiches and of course homemade biscuits are my breakfast favorites. I’m sure this cookbook would include some amazing new recipes to try! My favorite breakfast is pancakes and sausage. YUM! Love Gooseberry Patch cookbooks!! Growing up in Maine when I was a kid Homemade Blueberry Pancakes has always been my favorite!! Whenever I get the chance to go back to Maine I make sure that I stop into a diner and have some!! I love sausage gravy and biscuits…and pancakes, and eggs, and bacon…..Oh my. I love all breakfast! My favorite has to be homemade biscuits and gravy made with maple sausage, with a touch of sugar for flavor. My grandma’s cinnamon flop. It has become a standard for Saturday mornings in my house (except when it gets too hot outside for turning the oven on). I love almost all breakfast. It depends on the seasons too. Sometimes a fall breakfast with biscuits and gravy, or eggs and bacon, or in the winter a pancake feast! Thanks!! Our favorite is egg & sausage casserole. Thanks for the chance to win this book! I love toasted bread spread with Nutella and topped with slices of banana. I need help with Breakfast, always have the same thing, would love to get this book. Recipe sounds easy & tasty ! Looking forward to trying it ! Thank You !!! Toad in a hole! I think the silly name is why the kids ask for it so often. Favorite breakfast food would have to be the omelette…but then there are pancakes…and waffles….and French toast…jeez, who can come up with just one favorite??? I guess I don’t have a favorite breakfast food I like to try new recipes all the time and just LOVE cookbooks. Rarelt eat breakfast but when I do I love omelets! Also our new fav- we had for dinner- slice a red pepper to make a circle about an in thick, scramble an egg and add in a little cilantro, sausage,cheese- poor it all into the pepper slice and cook. sooooo good. Just found your site and nice give-a-way. Thanks for entering me! Favorite has always been scrambled eggs& bacon…now on muffins or layered with your own creation. I love praline french toast. I am a french toast fanatic! Thanks for the chance to win the cookbook. Love your recipes! Sausage Gravy over toast or English Muffins, Yummy in summer or winter. I love biscuits and sausage gravy with a side of scrambled eggs & grits… but the grits have to have the sausage gravy on them too!!!! My favorite breakfast food always begins with an egg. Our family’s favorite is a Stuffed French Toast Recipe that has become a tradition on Christmas Morning. As for me, if it’s Breakfast I like it all! I’m loving my breakfast casseroles! Pancakes every Sunday morning with my entire family- parents, brothers and their families, my kids, great Grandmother….awesome early Sunday mornings!! Blueberry French Toast with fresh blueberries and real maple syrup. Top it with fresh blueberry cream cheese. The best ever! Love love love breakfast casseroles because they are so easy and your family thinks you are a “Master Cook”!!! Lol!!! My favorite breakfast is breakfast for dinner! Homemade waffles with lot’s of bacon! I love Gooseberry Patch cookbooks. My favorite breakfast is omlettes with vegetables. This.cooking book looks lovely! My favorite thing to make for breakfast is.raspberry & cream cheese French toast. Take frozen raspberries and boil making into a syrup. Leave a.few.tablespoons aside and mix the rest with a softened 8 ounces of cream cheese. Stuff into French bread slices that have been cut into 1 inch thick.slices. Cook.each side of.the.slices on.a.skillet until lightly toasted. Drizzle raspberry sauce.over slices and.sprinkle.with powdered sugar. I love breakfast any time of the day. My favorite breakfast is a veggie omelet with a side of hashbrowns. Favorite is french toast with thick slices of raisin challah. My entire family loves Sausage Breakfast Casserole…quick and easy to prepare and so delicious!! Thanks and would love to win this cookbook to have new recipes to try for my picky family!! We love Bacon, Eggs, Gravy and home made Buttermilk Biscuits! I love almost anything made with eggs; partial to Finnish Oven Pancake with lingonberry sauce and maple syrup. My favorite is eggs, sausage and cheese casserole. Love your recipes. Breakfast is one of my favorite meals……even for supper! Thank you for this site and all that you do. Eggs Benedict made with crab insread of ham, since I cannot have pork products. My husband loves to make omelettes but my favorite breakfast is an old skillet recipe worth layers of hash browns, eggs, bacon, and topped with cheese!! Serve with fruit and wheat toast. My favorite is sausage, gravy and biscuits. My favorite breakfast food is and always has been FRENCH TOAST!!! I absolutely LOVE it!!! I cook, I LOVE cooking. I’m also a cert. Health Counselor and part of my work is teaching my clients that cooking a healthy meal from scratch doesn’t have to take hours. I love Eggs Benedict, one of my favorite breakfast dishes…I’m not so great at poaching eggs….yet 🙂 I plan to keep trying until I have it down! Thank you for this recipe blog! I love it! I love anything with blueberries in it for my brekfast. I see blueberries on the cover of this cookbook. Biscuits and gravy are tasty and omelttes with cheeses mushroom onion green pepper with fried potato! We love sausage gravy and biscuits! Thanks! I love French Toast with maple bacon on the side. Love it! Thanks for the opportunity to win the giveaway. Any breakfast made especially for me. Eggs, bacon and grits with biscuits & jelly are my relax and stay awhile breakfast. Fav get out and go is oatmeal. Breakfast is the meal I enjoy cooking the most. My favorite is an egg casserole made with ham and swiss cheese. A family favorite! My favorite breakfast is made by my husband. He makes the best french toast EVER!! Just LOve these cookbooks, I am a cookbook NUT. I just ove collecting all kinds of cookbooks! Breakfast is my favorite meal of the day. It’s the most important meal of the day. I love eggs, quiches, Old Fashioned Oat Meal, fresh fruit, pancake, waffles and a hot cup of coffee!!! I would love to win your new cookbook and use your new Breakfast recipes for our Tailgating Breakfasts for Football. Thank You so much. I love eggs benedict but rarely make it so I guess my favorite breakfast is a soft boiled egg with toast for dipping. We love breakfast, too, especially Eggs Benedict and I particularly love Brioche French Toast with marscapone and berries! My all time favorite food for breakfast would have to be biscuits and gravy made from bacon grease and evaporated milk. This always reminds me of my Mother she taught me how to make it this way and every time I make it I think of her. Love breakfast – even for lunch or dinner. One f my favorites is Baked Apple French Toast. It s so warm, homey, and looks like I worked on it for hours but it is sooooo easy. I was tickled to pieces to see a rack of your cookbooks at Drysdale’s, our local western wear store. Breakfast is my favorite meal of the day. Eggs, old fashioned oat meal with fresh fruit, quiche with veggies, pancakes, waffles. With football right around the corner, I would LOVE to win your cookbook for new creative Breakfast ideas for Tailgating Breakfasts. Thank You. Homemade waffles with maple syrup!!! My favorite is Semmel…a traditional German hard roll. We have them every Sunday morning. They’re good with jelly, honey and my fav, cheese. Oh Nancy, I would have to say my favorite is eggs with grits, county ham and redeye gravy with biscuits. Wow…now I’m hungry! I am an omelet fan….the stuff in it, the better I like it!!! Looks good! I’ve never had Eggs Benedict…just may have to try it this weekend. My favorite is a french toast casserole with strawberry sauce. Hard to choose just one – breakfast is my favorite meal of the day! Eggs Benedict is definitely at the top of the list, as is French toast, blueberry cobbler and breakfast burritos. I love an omelet with lots of fresh veggies, mushrooms, onions, bell pepper, spinach, and cheese. Breakfast and Brunch are my favorite meals to prepare. If I have to pick a favorite breakfast or brunch (hard to pick one) it would be homemade waffles. I love getting out the waffle iron on the weekend and trying out a new concoction. I will add about anything in my waffle mix! I would love some new ideas though and this cookbook sounds great! Blueberry pancakes top my list! Love your recipes, thanks for sharing them. My favorite breakfast is grits, eggs, bacon, & biscuits. I would love to win your Gooseberry Patch cookbook. Thanks so much for sharing your page with me. My favorite breakfast food is French ttoast. pancakes and bacon of course! this book looks great! One of my favorites is a stuffed omelet. I use whatever leftovers I have; veggies, cheeses, meats, even stuffing. Sometimes top it with salsa. Add a cup of coffee, maybe a piece of whole grain toast and you have a pretty healthy breakfast! My favorite breakfast food would be any type of french toast with a great cup of coffee. My favorite is creamed chipped beef over biscuits and some scrambled eggs. I could eat breakfast for every meal! Love this cookbook! My favorite is eggs, grits, bacon, milk gravy, and biscuits. Nothing better on a Southern morning. I love a good breakfast casserole, either with sausage or ham. Yum! My favorite breakfast food is French Toast with Rasberry topping!! YUM! I love French Toast…covered with melted butter, and powdered sugar! Breakfast is my favorite meal to serve to guests, our family holidays always include a brunch! The make ahead casseroles that you can put together the night before make it super easy! I love anything with blueberries…pancakes, french toast, yogurt, oatmeal…the list goes on and on. I love all breakfast foods but if i had to pick a favorite it would have to be a western omlet. I love my low calorie and low fat egg and bacon taquitos..Yummy!! Stuffed french toast. A layer of french toast,then sausage, french toast, bacon and topped with more french toast Drizzle with maple syrup. I love making different breakfast casseroles mostly with eggs, bacon, onions, and peppers! My favorite breakfast would be when I have company, I like to start with Duncan Hines Blueberry Muffins, which I use buttermilk, cinnamon, pecans, vanilla, lemon zest; then make a quiche using bacon bits, chilis, cheddar cheese and sauteed mushrooms; next up is a bowl of fresh fruit marinated in Gran Marnier and cinnamon and vanilla yogurt and nuts; and lastly, Chicken Apple Sausage. Of course, I love to search my Gooseberry cookbooks for new recipes to switch out and add – how yummy! This breakfast/brunch cookbook would be a great addition to my cookbook collection! My favorite breakfast is Stratta! Unfortunately I only make it twice a year… Christmas eve for Christmas morning and when we leave for our family vacation in the summer. I make it up the morning we leave and put it in the oven for the first morning of vacation. I include ham, onion, mushroom, cheddar cheese, scallions. Sometimes I mix it up with whatever I have on hand. I love pancakes with bananas and cinnamon. I love omelets, too. Breakfast out is my favorite though. Usually it’s coffee and cereal at home. Our family loves breakfast casserole which I make for special events: first day of school, Christmas morning, Easter. Would LOVE to have this cookbook! Thank you. Breakfast is my favorite meal to prepare, I have never tried to make eggs benedict but this recipe seems pretty simple, so I will be trying this for sure! I think this cookbook would be an awesome addition to my collection (LOTS even some from my great grandma). Cooking is my therapy and my passion. Good luck to all and God bless! My favorite breakfast is french toast! Yummy! It is really a toss up, I love breakfast foods!!! I love pancakes and I love eggs sunny side up with toast and bacon!! The best breakfast ever was the one my Mother used to make with scrambled eggs, homemade sausage gravy home fries and tennessee sausage! Heaven! Eggs over medium, rye toast and fresh sliced potatoes fried in an iron skillet, especially when camping. Everything tastes better when fixed outside!!! I love French toast with a strawberry sauce and fresh strawberries and bananas and whipped topping over the top with a little powdered sugar. Yum!! My favorite Breakfast I eat every day is Oatmeal with 2 scoops of peanut butter and a handful of Dark chocolate chips!! Keeps you full for hours!! We love biscuits and gravy, preferably with bacon but sausage works also. I personally like to add fried apples. Yum Yum! Breakfast Burritos! Mmmm… My Favorite! This cookbook looks awesome. I would love to win it. My favorite is sauage gravy and biscuits! Good morning! My favorite breakfast food is fried eggs..bacon..gravy..hashbrowns..biscuits and cooked apples! My favorite breakfast food is a sausage and egg breakfast casserole that I make on Christmas morning. It’s not only delicious, but it reminds me of good family times as well. Thomas’s English Whole Wheat Muffins with Peanut Butter. Very favorite is biscuits with sausage gravy! I love cinnamon rolls for breakfast. I believe that breakfast is my favorite meal. I love cheese grits, eggs, bacon, fresh tomatoes and biscuits and gravy! Yum yum! May have to try this – Would really like to win this cookbook! I LOVE 2 pancakes with an over-easy fried egg between them, bacon or sausage and toast with homemade jam. Haven’t tried Eggs Benedict at home, but will with your recipe, since it is my son’s favorite breakfast. Dutch Babies. OMG these are by far the most amazing yummy things I have ever had fr breakfast! This is the hardest question ever!!! I’m going to have to go with breakfast sandwiches on croissants…and mimosas. Breakfast casseroles are the best. throw them together and put in the oven and then enjoy your coffee til it’s done. My favorite breakfast is eggs benedict and porkroll!! I’ve only made eggs benedict at home once before and it was pretty good but I usually have to go to the diner to get it! Breakfast foods are the best, I could eat them all day!! Thomas English Wheat Muffins with peanut butter. French toast is our favorite! My favorite breakfast food is Biscuits and sausage gravy, grits and two eggs over easy! Thanks for hosting the giveaway! I have to share my husband’s fav as he is the big breakfast eater. He love bacon or patty sasauge, friend eggs over easy, potatoes obrien and sourdough toast. First, thank you in advance for the give a way and the recipe!! We have a family holiday tradition of a sausage, bread baked omelet. Because of all the memories of making it together as a family, it is my favorite! Eggs over easy, loads of chewy bacon, grits and homemade biscuits with fig preserves!!! Yummy! I just love you girls!!! Keep up the good work. My favorite is creamed chipped beef and gravy. Mine is creamed chipped beef and gravy. For breakfast, I’d like an asparagus-tomato-feta omelet, please – with some crispy home fries on the side, and a cup of milky tea. Yum! I love greek yogurt with granola and sliced banana and peach, super tasty! My favorite breakfast is creamed chipped beef over biscuit. Family memories. I also love a goo quiche. My favorite breakfast is a recipe I got from my boss over 30 years ago. In a casserole dish put bread, sliced cheese and ham then top with an egg mixture!! I’ve seen variations of it but it is delicious asit is. I love eggs over easy,toast,homefries and bacon. On the eggs put on some mild yellow pepper rings. Include a mug full of coffee. A breakfast fit for a queen or just me. I love a nice sausage and egg sandwich on on english muffin, or some oatmeal with blueberries and strawberries. My favorite breakfast is homemade granola, fresh fruit, and Greek yogurt! My husband makes the best egg macmuffin you ever tasted so that is my favorite breakfast. Not only is it simply delicious I don’t have to cook it. My favorite breakfast is definitely eggs Benedict!!! My favorite breakfast is a Denver omelet with whole wheat toast. Yum! German Pancakes baked in the oven adn filled with strawberries when they come out! My all time favorite has to be biscuits and gravy with chicken fried steak. Yummy, yum, yum. Love your recipes! My favorite breakfast? Strata with sausage or bacon and REAL maple syrup….YUM! I do love Eggs Benedict and order them when out unless they have Eggs Florentine Benedict on the menu, then definitely order that as I love the spinach on them…. yummmmm. Have purchased many of the Gooseberry Patch cookbooks but would love to be able to win one free. Thanks for that opportunity !! My favorite breakfast is: Scrambled eggs, crisp bacon, a piece of buttered wheat toast and a cup of strong coffee. I think waffles or corned beef hash. Ooh, or a western omelet. I just love breakfast! My favorite breakfast is Pancakes with Chicken Gravy! My father and I were the only ones that liked this combination, so it was our special breakfast! Still love it…once you try it you will like it too! My favorite breakfast is the times when my family would pack up the car and head for our favorite camping spot in the mountains. Often times several other relative familes would meet up there too. We built a fire and cook a breakfast of fried eggs, hash browns, and bacon or sausage. A pot of coffee would be there for anyone who wanted a cup. Sometimes we would bring stuff for a simple sandwich lunch and other times we would be gone before noon. But those times will always be a favorite of mine. Good times and great food. Biscuits and gravy. Still looking for a recipe that equals the B and G that a small cafe here in town served. They were the best. I just had eggs Benedict yesterday! They are good. For me, though, nothing beats eggs (over medium), crisp hickory-smoked bacon, grits, toast and fruit. So good! I love traditional breakfast, or even cold pizza! I usually have an egg, toast and juice, but I’ll eat most any type of “breakfast” food.. anytime of day! My favorite breakfast would be french toast with warm syrup and bacon! I think I would have to agree that Eggs Benedict would quaify as my favorite with a close second of Srawberry Waffles! eggs Benedict is actually my favorite breakfast food! I love eggs benedict for breakfast with a dish of fruit on the side. YUM!!!! My favorite breakfast to make and to eat is Sausage Pinwheels and my family loves them too!!! My favourite breakfast is, in fact, eggs benedict, and I would love to win one of your books! It all sounds good; I’ll take mine with a side of hashbrowns. Ham & cheese omelette with mushrooms or eggs benedict. Eggs Benedict get my vote! A bowl of oats with cinnamon, flax seed, wheat germ, nuts and fruit! I have two favorites: Sausage gravy and biscuits and the other is vanilla yogurt with fruit and granola-I know two complete opposite meals if ever there was. i like eggs benedict and pancakes.. Favorite breakfast would be… Taylor’s pork roll, egg and cheese on a roll. My favorite breakfast is biscuits and gravy!! My very favorite breakfast ever is smoked salmon benedict with a slice of tomato and homemade holindaise and caper sprinkled on top…. yumm! I love a large country breakfast, bacon, scrambled eggs, biscuits and gravy, and fried apples on the side. I love breakfast foods any time of the day. My favorite though is hot pancakes with warm maple syrup and some bacon on the side. My favorite breakfast is a cheese omelet, bacon on the side, hash browns and toast!! Of course, I can’t eat that everyday! But I really like eggs and can eat them anyway- over easy, scrambled, poached, soft boiled, and my 2nd all-time kid favorite- eggs in a frame! I like eggs, bacon & toast. I enjoy biscuits and gravy as well as homemade waffles with sausage and eggs. I love homemade waffles with scrambled eggs and sausage and orange juice. My all time favorite breakfast is over medium eggs, creamy grits, bacon and homemade biscuits with apple butter. Life don’t get any better than that unless you have a home grown red tomato to slice to go with the biscuits! Now that’s good ol’ southern eattin’. Happy Breakfast to everyone and I can’t wait to try the eggs benedict. My favorite breakfast food is bacon…..bacon w/eggs overeasy, bacon w/peanut butter toast or an omelet w/bacon bits, veggies & cheese. I like waffles with a berry sauce. I alsi love French Toast with Bacon – what a yummy treat! I Love yogert with fresh berries for breakfast! My favorite breakfast would have to be sausage gravy over biscuits and home fries. I could eat them every day though I will definitely try the recipe for Eggs Benedict, sounds yummy. I absolutely love biscuits and gravy w/sausage!!!!!! I’m a breakfast girl and love all breakfast as long as its cooked fresh & with family and friends! That is my favorite too Denise,do you have that recipe? My favorite breakfast food are the breakfast tortillas my husband creates. He always uses eggs, but adds a unique variety of delicious veggies, cheeses and meats. You never know what he’ll put in them, and they’re always so good! I am a TEXAS girl so Biscuits & Sausage Gravy with scrambled eggs are my fav! And yes, I am a big fan of grits too!!! I will try this recipe of the Eggs Benedict. I am a big breakfast fan and often have breakfast items for dinner. 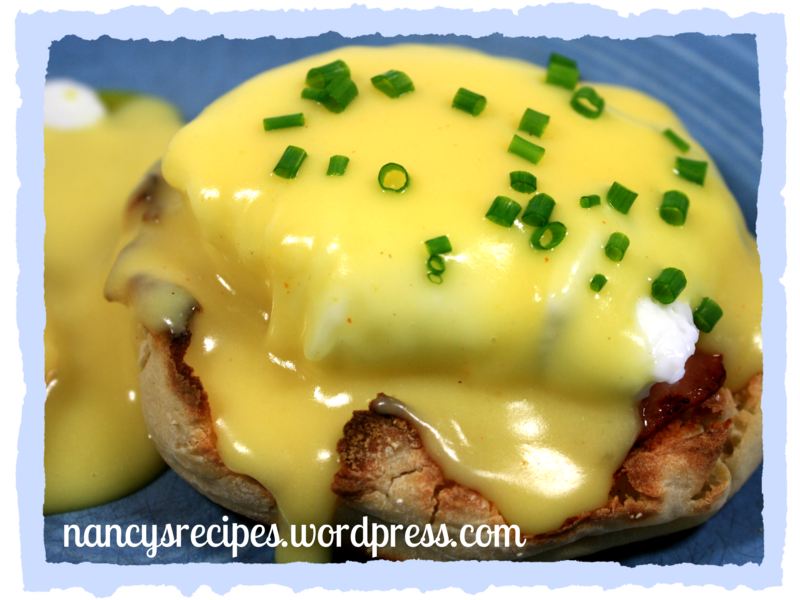 This Eggs Benedict recipe will definitely be my next breakfast for dinner entree!!! Thanks for sharing this recipe! And thanks too for publishing such AWESOME cookbooks! My favorite breakfast is scramble eggs and cheese melted over them,home fries with fried onions and habbersett scrapple(extra crispy!) yummy! I love Eggs Benedict as well, I totally agree with the package Hollandaise sauce, although I’m sure the home made version is better I’m just too lazy. My favorite breakfast is eggs, bacon, toast and orange juice. scrambled eggs, bacon, and hash browns, and sometimes add a pancake sometimes. I’m torn between Cinnamon Roll French Toast and Biscuits and Gravy. Love them both. Guess it just depends on if I’m in the mood for something salty or something sweet. My favorite is a bacon, egg, and cheese biscuit. I have never tried eggs benedict. Never found an easy recipe before but the picture seems to have caught my attention and I will have to try it. Homemmade biscuits,buttered, covered with fresh cooked peaches. My mom used to make this, then I made it for my family. You wash, peel, and slice the peaches, and cook with sugar to taste. Also like chocolate gravy or sausage gravy and biscuits. Would love to win the cookbook! Bacon, Egg and lots of Cheese, Biscuit! Crab Cake Eggs Benedict or Eggs Benedict Florentine are heavenly! My favorite! Cheese and tomato omelets with blueberry muffins! (And of course, a big mug of coffee!!!!) YUM! My favorite breakfast is a 3 minute boiled egg, with a slice homemade english muffing bread toasted and spread with margarine. Topped off with a cup of coffee and a glass of orange juice. I love breakfast for supper too. Breakfast is my favorite meal! My favorite breakfast food is French Toast. I like blueberry muffins for a quick breakfast. If I have time I like to make french toast. My favorite breakfast is scrambled eggs, bacon, refried beans, fried potatoes, and a couple of tortillas. Nothing like a hearty breakfast to start your day! I love to cook but when I get a chance to go out for breakfast, my favourite is a cheese and mushroom omelet, with home fries and whole wheat or rye toast. Always enjoyable with a good cup of hot coffee. French toast with warm maple syrup. Besides the obvious of Eggs Benedict I really enjoy a good breakfast overnight casserole. All my favorite breakfast foods rolled into one. Bread, Eggs, sausage, ham, cheese and vegetable of choice. Who could ask for more. YUMMMMMMMMMMMMMMM! Biscuits, gravy and sausage! Love them! Ooey, Gooey Monkey Bread is my all-time favorite breakfast treat…YUMMO! I love scrambled eggs and blueberry muffins. Blueberry pancakes with turkey sausage! I love all breakfast foods! Bacon. Sausage. Eggs. I love breakfast in general, haha. It’s definitely my favorite meal. If I had to narrow it down, I’d say a ham and cheese omelet. Simple, yet delicious. My favorite breakfast is blueberry pancakes with real maple syrup – especially if I pick the bluberries! Complete with a cup of coffee and my family and I ‘m in heaven! Love to make Eggs Benedict when have time. Also like shrimp and grits made in Low Country style. Then there is the standard of cheese grits, sausage, bisquits, and an egg over easy. Homemade pumpkin chocolate chip pancakes! At home…homemade buttermilk biscuits (like my mother-in-law used to make) with a side of gravy or syrup, hash browns, fried eggs, and thick-sliced smoked bacon. When I go out, my breakfast of choice…eggs benedict. Yum! I love Stratas, Frittatas, and just about any breakfast casserole with spinach and mushrooms. I love Biscuits and Gravy, but I rarely make it because it’s so bad for me! Nothing fancy for me……just a plain old fried egg (over easy) with bacon, wheat toast and a good cup of coffee. My favorite breakfast food is bacon…and grits. I love french toast! Nice & crispy on the edges with butter melting all over and a good helping of powdered sugar soaking up that butter to make a crazy good lil accidental icing! Oh boy am I hungry now!! Love your blog! I’ve never had eggs benedict but I’d love to try it! My very favorite breakfast food is Sausage Gravy over biscuits, with a side of grits! Would just love to win this cookbook! I too love Eggs Benedict, but have never made it at home. Breakfast is one of my favorite meals! red eye gravy and buttered grits. I have never had Eggs Benedict, but the featured picture looks wonderful! Would love to try it.